With Christmas just around the corner, less than 20 days in fact, we want to share our favourite gifts for men this Christmas. 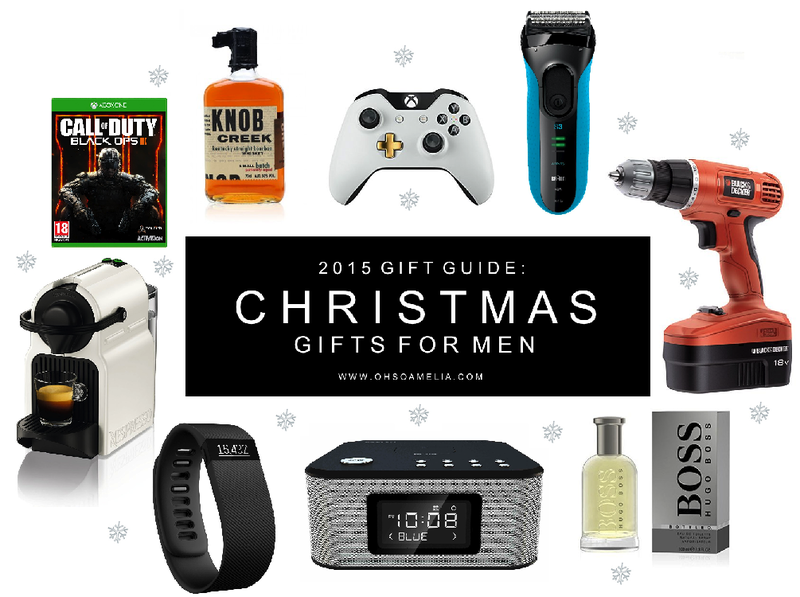 You can find previous gift guides here for more inspiration but today is all about then men if your lives. I don't know about you but I find men extremely difficult to buy for. They usually already have everything they want or don't give me any clues as to what they may like. So I usually end up browsing the web for some ideas and buy a random selection of gifts for everyone. Here are some gifts for him which will hopefully give you some ideas on what to get the men in your life! Call of Duty: Black Ops III (Xbox One) - If you know an xbox addict how about treating them to the new Call of Duty game which was released last month. Knob Creek - How about treating dad to a bottle of this 9 year old whiskey. It was named 'Best Bourbon Whiskey of 2015' and will definitely go down well. Take a look at 31Dover for more fantastic alcoholic gift ideas. Official Xbox One Special Edition Lunar White Wireless Controller - Another great gift for any xbox lovers, surprise them with this special edition lunar white wireless controller. You can never have too many controllers especially when friends are over. Braun Series 3 Men's Electric Shaver - An ideal gift for men, whether it be your partner, dad, brother or granddad, treat them to this Braun wet and dry electric shaver for a close shave. A whole hours charge lasts a week! Boss Bottled by Hugo Boss - Who doesn't love getting smellies at Christmas? This bottle of Boss by Hugo Boss is a favourite amongst many men so why not treat him to a new aftershave. AZATOM® Home Hub Lightning Dock - The docking station is perfect for the gadget lover, reasonably priced too so you won't break the bank. Perfect for iphones or ipads and will look great in any home. Fitbit Charge Wireless Activity Tracker and Sleep Wristband - For the fitness fanatics, the Fitbit Charge is on top of many gift lists this Christmas. The next stage up from the original Fitbit, the charge does a whole lot more! Nespresso Inissia Coffee Capsule Machine - One for the coffee lovers, treat him to a new coffee machine with the Nespresso capsule machine. This means you can have a lovely cup of coffee every time you visit them or at home. What are you planning to buy for him this year? Don't forget to keep an eye out for more gift guides in the run up to Christmas! * For details on how I work with brands take a look at my work with me page. That's awesome post for us in chritmast. Nice. Very useful guide, here is my own 2017s Christmas gifts top http://www.christmasgiftstop.com/best-christmas-gifts-for-a-boyfriend/ you can find there a lot of great gifts for your boy or husband, sure he'll like it. Hope it will be useful for you. Good luck. Very nice selection of Christmas Gifts. Really appreciate your selection. Thanks. In the event that you wish to display curiosity in type of corporate Christmas gifts then it won't be an awful plan to give whisky decanter and classes. Such a gift is an ideal approach to congratulate your affiliation and holding with the customer https://www.thechristmasflowersdelivery.com/. The decanter and the glasses are accessible with cone shaped bases. This is something which is distinctive in fashion and would add an additional measurement to your customer's want to remain upbeat amid the season. Zagwe Ethiopia Tours & travel is an exclusive tour company With a squad of experienced professionals , we afford the best vacation holidays in Ethiopia.